Nelumbo lutea (Willd. ) Pers. 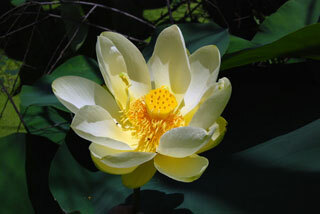 Also Called: American lotus, water-chinquapin, yellow lotus. Stems: Rhizomes, horizontal, to 50 feet long, rooted in mud; slender, elongated, 1/4 to 1/3 inch in diameter, with terminal portions later in growing season much enlarged, thick, banana-like. Inflorescences: Solitary flower, held above water on long, stout stalk. Flowers: Showy, 4 to 10 inches across, not particularly fragrant; sepals and petals similar, numerous, 1/2 to 5 inches long, pale yellow or cream; tips blunt or rounded; stamens 100-200, arranged spirally; pistils numerous, embedded in pits in receptacle; receptacle to 4 inches in diameter, top flat, base tapering, when mature becoming dry, hard, brown, nodding. Fruits: Nut-like, 25-30, somewhat spherical, 2/5 to 3/5 inch in diameter, hard, 1-seeded. Habitat: Still water of lakes and ponds, marsh pools, slow-flowing streams; water less than 36 inches deep. Reproduction: When mature, the receptacle nods downward, allowing the fruits to drop into the water. Germination takes place after the tough shell of the fruit is softened by soaking for an extended period of time. The seeds can remain dormant for many years prior to germinating. Forage Value: Birds and marsh animals eat the seeds and tubers. Uses: Native Americans peeled and boiled the tubers and ate them as vegetables; cooked the tubers with meat, corn, or beans; sliced and dried the tubers and stored them for winter use; used the seeds in soups and cooked with corn; and roasted the seeds like chestnuts. Many Great Plains tribes attributed mystic powers to the plant. Comments: Aquatic. Nelumbo comes from the Sri Lankan name for the Hindu lotus. Lutea is from Latin lutens "golden yellow". American lotus can be aggressive and difficult to eradicate. It is pollinated by bees.